Pumps for a sprinkler system in the Mackintosh-designed Glasgow School of Art arrived the day before fire destroyed the historic building. The British Automatic Fire Sprinkler Association (BAFSA) has confirmed that the large devices required to operate the planned water mist system had been delivered before a huge fire ripped through the building. However, it would have been some weeks before the sprinklers were operational as the pumps would have taken time to install. A fire that started on Friday 15 June 2018 largely destroyed the building, which is the seminal work of Scottish architect Charles Rennie Mackintosh. The building was undergoing a £35 million refurbishment following a smaller fire in 2014. 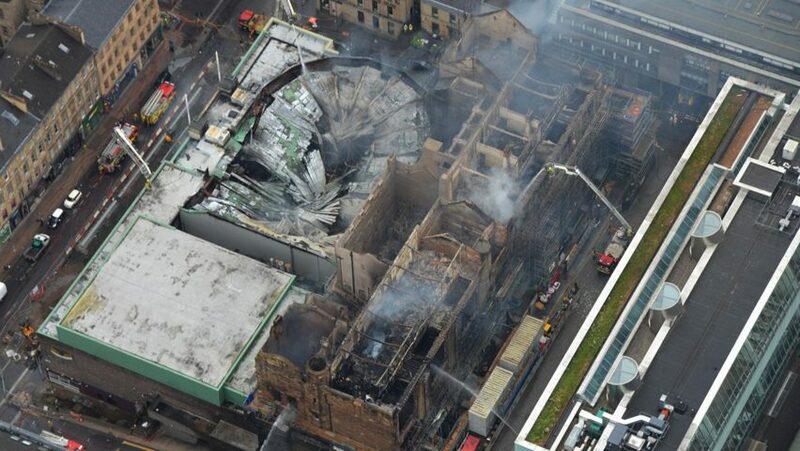 "The pumps for the fire suppression system were there at the school of art the day before the fire," BAFSA chief executive Keith MacGillivray told BBC Scotland. "They are very large pumps so they were delivered in component parts," he added. "It would have taken some weeks to reassemble the pumps and connect up the pipe work and obviously the water tanks would have had to be connected and put in place as well." Walls could collapse "without warning"
Drone footage released by the school last week revealed the extent of the damage, showing Charles Rennie Mackintosh's masterpiece reduced to a burnt-out shell. Glasgow City Council has warned that the fire damage is so extensive that parts of the burnt-out walls could collapse at any time. "There is a risk that parts of the building might fall into Scott Street or Dalhousie Street," the council's head of building control Raymond Barlow said in a statement. "This could happen without warning." The refurbishment of the art school carried out by Scottish studio Page\Park Architects was nearing completion, including recreating the famous library. Reports suggest most of this work has been lost in the second blaze. Although the investigation by the Scottish Fire and Rescue Service into the causes of this latest fire will take months, debate is already raging over whether a second attempt should be made to save Scotland's most iconic pieces of architecture. Experts have put the cost of such a project at £100 million, over three times as much as the last restoration project. Writing in Dezeen, architect and academic Alan Dunlop argued that the architecture community needed to accept that Mackintosh's building was gone now, and that to build "a sad replica" would be an insult to Mackintosh's legacy. However, critic and architectural theorist Mark Cousins has countered that demolishing the building would be too huge a loss to Scotland's cultural legacy to countenance. Main image is courtesy of Police Scotland.